At the Port of Pariacabo in French Guiana, the Zefiro 23 and Zefiro 9 solid propellant stages for Arianespace’s lightweight Vega vehicle are unloaded from the MN Toucan sea-going vessel for their transfer by road to the Spaceport. Elements have arrived in French Guiana for the next Vega launcher, which is scheduled for a November mission from the Spaceport to deploy Europe’s LISA Pathfinder – a pioneering scientific spacecraft that will set the stage for observing the Universe in a completely new way. The Zefiro 23 and Zefiro 9 stages for Arianespace’s lightweight launcher were delivered to French Guiana this month aboard the MN Toucan, one of two ships regularly utilized for transporting Arianespace launcher components from Europe to the company’s South American operations base. They were part of the MN Toucan’s cargo that also included components for an Ariane 5 to be used on a September mission with two telecommunications satellites. Zefiro 23 and Zefiro 9 are the solid propellant second and third stages, respectively, for the four-stage Vega launcher, which is produced by industrial prime contractor ELV – a jointly owned company of Avio and the Italian Space Agency. Most existing knowledge about the Universe is based upon the observation of electromagnetic waves – such as visible light, infrared, ultraviolet, radio, X-rays and gamma rays. The European Space Agency’s LISA Pathfinder will pave the way for astrophysicists to address some of the most fundamental questions about the Universe and possibly address new ones through a new observation method. For the first time, LISA Pathfinder will help test and validate the technology in space needed for detecting low-frequency gravitational waves, which are ripples in space-time predicted by Albert Einstein’s theory of general relativity. While operating in a 500,000 km.-by-800,000 km. halo orbit around the first Sun-Earth Lagrange point (located 1.5 million km. from Earth), the spacecraft will put two test masses in a near-perfect gravitational free-fall controlled by electrostatic fields. LISA Pathfinder’s inertial sensors, a laser metrology system, a drag-free control system and an ultra-precise micro-propulsion system will be used to control and measure the masses’ motion with unprecedented accuracy. Scientists predict that gravitational waves should still be “echoing” from the Universe’s formation, and the detection of these waves by LISA Pathfinder would be the most fundamental discovery of its mission. The Airbus Defence and Space-built spacecraft also will measure gravitational waves generated by objects such as collapsing binary star systems and massive black holes. 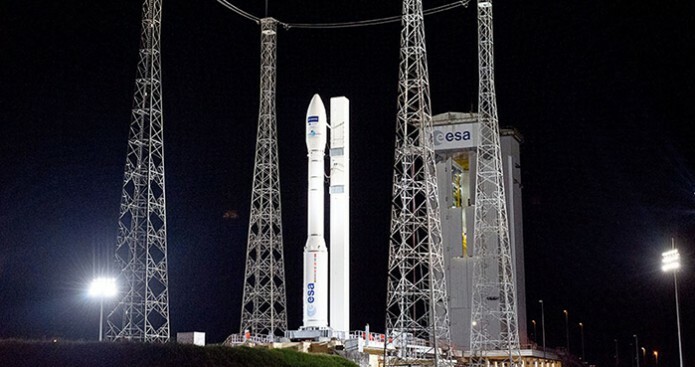 The mission to loft LISA Pathfinder is designated Flight VV06 in Arianespace’s launcher family numbering system, and will be the sixth Vega launch from the Spaceport since its introduction, as well as the lightweight vehicle’s third this year. It follows June’s Flight VV05 to deploy Sentinel-2A and the February suborbital mission with the Intermediate eXperimental Vehicle (IXV) spaceplane on Flight VV04. Activity for Vega’s late November mission is part of ongoing launcher and payload preparations to support four upcoming Arianespace launch campaigns in French Guiana, along with: Ariane 5 Flight VA225 on August 20; September 10’s Soyuz Flight VS12; and a September mission with Ariane 5, which is designated Flight VA226. To date, Arianespace has performed six launches in 2015 from French Guiana, comprising three flights with the heavy-lift Ariane 5, two Vega missions and one medium-lift Soyuz launch.